The modern city is, for the most part, built around cars. We build enormous elevated roads and huge parking structures to accommodate our vehicles, but at what cost to the urban landscape and to our own well-being? These 10 visionary designs seek to re-imagine what the city of the future might look like if we stop catering our living spaces to cars…and start designing them for people. By most measures, living in the city is much greener than living in a suburb: less driving is generally required, and a city dweller’s overall environmental footprint is usually far smaller than that of someone living far from the center of a city. But many contemporary cities are unsafe for pedestrians, full of automobile-related pollution, and centered much more around cars than around its inhabitants. Urban occupancy rates are growing by leaps and bounds, and it’s expected that within the next two decades some 60 percent of the Earth’s population will live in cities. What kind of city do we want to live in: one centered around cars with no room for pedestrians, or one with green spaces, plenty of public transportation, and with features that are welcoming to pedestrians and cyclists? Our Cities Ourselves is a theoretical exploration of what our cities might look like in the year 2030. The project, developed by the Institute for Transportation and Development Policy, pairs some of the world’s leading architects with ten cities around the world and asks what kind of urban spaces we want to create for our future. Going forward, can we find the motivation to undo the car-centric urban designs that have dominated the world’s urban landscapes for the past century? These ten designs outline some of the best and brightest ideas for making the city a healthier, happier, less-car-centric place. They all focus on a specific site in each city and how to make that site better for future generations of city dwellers. Ahmedabad, the seventh largest city in India, was once a lovely city filled with pedestrians. Today, though, it’s much more common to see streets clogged with cars and motorcycles. The proposal from HCP Design and Project Management would add in more effective public transport to cut down on the number of personal vehicles in the streets. The plan also includes a mid-city mixed-use development in a large lot that is currently vacant, and plenty of space for pedestrians and cyclists to safely get around. 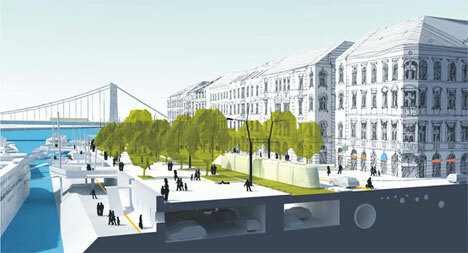 Budapest, unlike the other cities in this project, isn’t experiencing a growth in population. But the transportation infrastructure in the historic city is aging and in desperate need of an update. On top of that, the public spaces in the city could use revamping to make them more inviting to pedestrians. The plan from Varos-Teampannon and Kozlekedes would incorporate smaller roads, an underground road at the waterfront, and a people-friendly public space at the bank of the Danube. 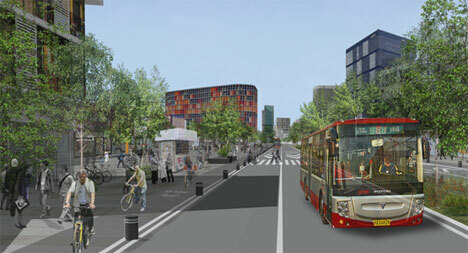 Trams would function as Earth-friendly public transportation in the heart of the city. Buenos Aires is a vibrant, fascinating city. 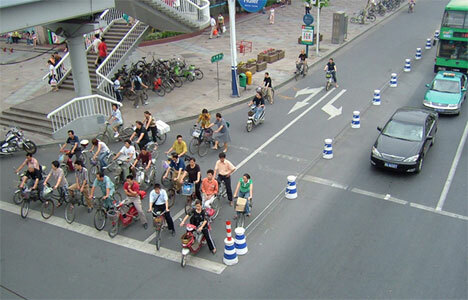 But like many cities around the world, it has fallen victim to unsightly roads and uncontrolled traffic congestion. 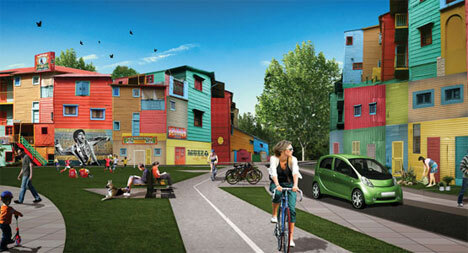 The plan proposed for the city by PALO Arquitectura Urbana would transform the city’s old freight train line into a new pedestrian and bike boulevard, add a colorful people-friendly waterfront area, and encourage the use of buses, water taxis and bicycles for residents and visitors to get around. Dar es Salaam, Tanzania’s largest city, has experienced a rapid growth in population and the related degradation of the transportation infrastructure. People rarely get around on foot in the city, and the public space isn’t used as effectively as it could be. The goal of the proposal from Adjaye Associates is to brighten up the public spaces, allow access to the waterfront, and revamp the available public transportation options. Guangzhou is a densely populated and rapidly growing city. 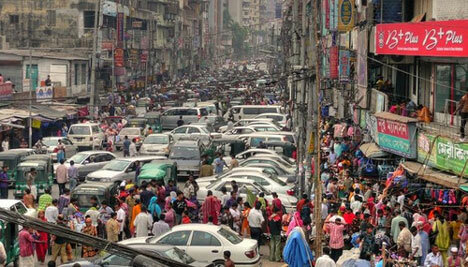 Although it used to be very walkable, the city is increasingly clogged with cars. The once-vibrant public spaces are becoming overtaken with automobile-centric infrastructures. 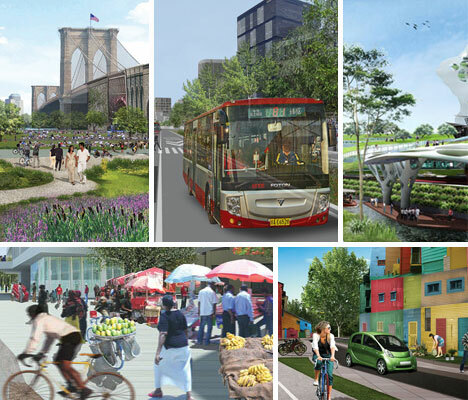 Urbanus Architecture & Design proposes a revitalized city with elevated public spaces and modernized housing, a new public transit system and a wonderful pedestrian and bicycle promenade. Jakarta is an absolutely beautiful city, but due to its dense population and abundance of cars it suffers from some of the lowest-quality air on the planet. 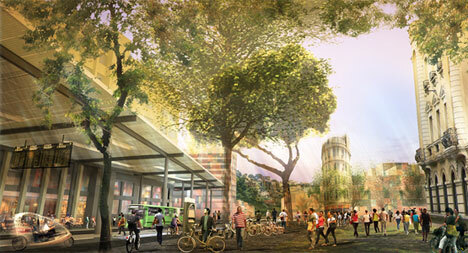 Budi Pradono Architects developed an idea for revitalizing the city that focuses on Manggari, a transit hub. The idea would avoid uprooting and displacing currently developed communities, instead connecting existing and proposed transit systems while preserving existing neighborhoods. Parks and other public spaces would be created on the rooftops of the mass transit stations, providing recreational space above and shade below. 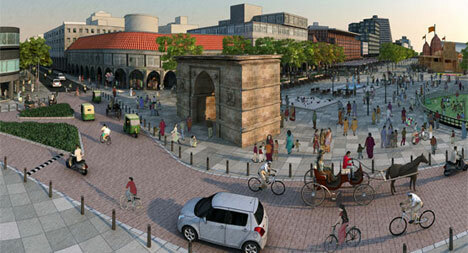 Dirt paths along the canal would be revamped into promenades for modern cycle rickshaws. Johannesburg has been the setting of many historic events throughout its long history, and currently the Soweto Township area is experiencing a revitalization. 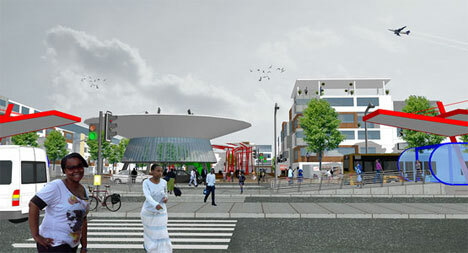 A proposal from Osmond Lange Architects and Ikemeleng Architects would link up the public transit systems which have recently been developed in Soweto. 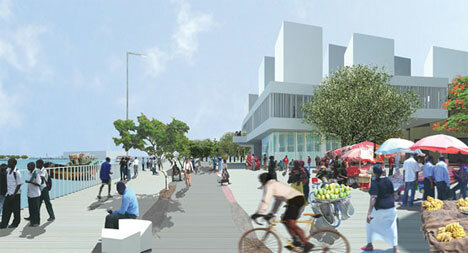 The proposal also includes ravamping public spaces to make them brighter, safer and more pedestrian-friendly. Mexico City shows a population pattern seen in many cities all around the world: the city center has been losing occupants while surrounding areas have been experiencing tremendous growth. 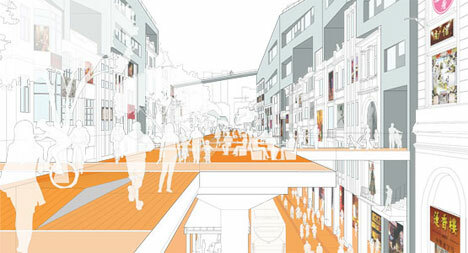 Arquitectura 911sc proposes a major overhaul of Mexico City’s center: moving streets underground, building a continuous pedestrian plaza above major roads and creating safe, accessible places for pedestrians and cyclists. Rapid transit buses would be able to share these spaces, but other traffic and unregulated buses would be relegated to other areas. New York is a city that is constantly reinventing itself, but one trend that has continued unchecked is the massive increase in vehicles in the city. 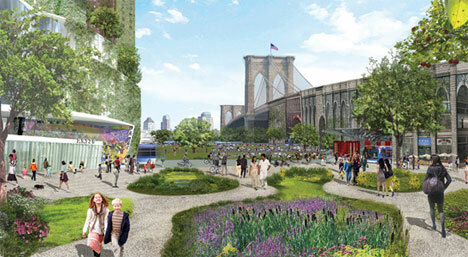 The proposal for the city from Terreform and Michael Sorkin would focus on the Manhattan side of the Brooklyn Bridge, currently overrun with highways and parking lots. The revamped city would remove some of these roads, add ample pedestrian walkways, and make Lower Manhattan an “eco-zone” where only ultra-clean cars and trucks would be allowed access to the roadways. An undeniably vibrant city, Rio de Janeiro also has a number of challenges. Squatter settlements, infrastructure problems and safety concerns have turned Rio de Janeiro into a city where many residents don’t spend much time outdoors enjoying the scenery any longer. Fabrico Arquitetura and CAMPO Aud’s vision of a new city involve a large, safe pedestrian pathway between residential and recreational areas, bike paths, the revitalization of empty lots, and a large canopy above the pedestrian walkway to provide shade.